Can Handle 4K Gaming, 8K Production Work EasilyEnjoy the latest games with the AMD Radeon VII graphics card. Powered by 7nm technology, delivering vivid gaming visuals in up to 4K and the capability to play VR games, don't get held back with your work anymore with virtually limitless content creation in 8K and more. With support for DirectX 12 and Vulkan the AMD Radeon VII will deliver incredible gaming experiences with ultra-smooth and consistently high framerates at 1440p, ultra wide and 4K. With 16GB of HBM2 memory the AMD Radeon VII is suited for memory intensive applications. Create content with ease, even in 8K resolutions, improve your work pipeline and enjoy it at the same time. 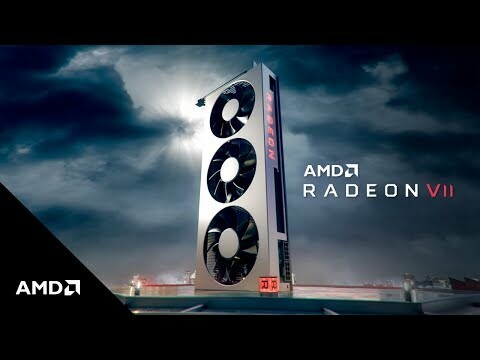 World’s First 7nm Gaming GPU with 16GB Memory AMD have designed the world’s first 7nm gaming GPU, with a massive 16GB HBM2 memory and incredible speed of 1TB/sec memory bandwidth, the Radeon VII has increased memory and memory bandwidth that beats other GPUs in its range, the extra power will help in providing more stunning visuals and greater performance in games and content applications alike. Play Top End Titles with Ultra HD Resolution With Radeon VII graphics you can achieve seamless, high refresh, HDR gaming at 1080p, 1440p and 4K or power the next generation photo and visual creation applications on razor sharp, vibrant 8k monitors. State-of-the-art Radeon Software brings exceptional gamer-centric features, along with highly personalized intuitive out-of-box gaming experiences. Get the Best Smooth Gaming Experience Pair your new AMD Radeon VII GPU with a large selection of FreeSync gaming monitors. With such a wide array of monitors equipped with Radeon FreeSync or Radeon FreeSync2 HDR available you can enjoy choosing monitors that are styled and run how you want, but by choosing a monitor with FreeSync and combining it with an AMD card of this caliber the results will be a stutter-free, tear-free and artifact-free smooth gaming experience. Sapphire Radeon VII 16GB HBM2 VR Ready Graphics Card, 7nm 2nd Gen. Vega, 3840 Streams, 1400MHz GPU, 1750MHz Boost is rated 5.0 out of 5 by 2. Rated 5 out of 5 by Nattydread from Works great on linux Smooth Ultra HD 4k gaming experience. I used open source drivers on linux. The free games Devil May cry 5 and Resident evil 2 work on steam play, but the third game division 2 is not available as it requires a windows account. Rated 5 out of 5 by Tango from Ryzen 2700X and Radeon VII Review For this testing, only official PC games with in-game benchmarks will be used that I own; only official Game Developers FPS counters will be used. In-game benchmarks will show less difference between GPUs because Game Developers include representative cross-sections of their PC game. 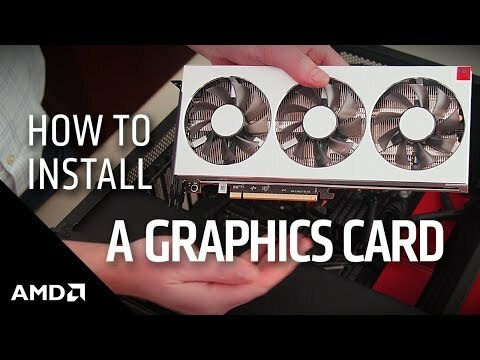 Most PC games have entire segments of maps that are less demanding for GPUs, which wipe out a portion of the FPS differences between GPUs around similarly performance points. AMD Labs' released FPS result for 25 PC games. The average difference was 28.59% between the RX Vega 64 LC versus Radeon VII. The switch to in-game benchmarks will show around a 4% lower difference between the two GPUs. New target Metric=24.59% Next, Fallout 76 (68.35%), Doom 2016 (33.18%) Battlefield One (35.98%), Battlefield V (33.19%), The Witcher 3 (33.82%) cannot be benchmarked as they do not have In-game Benchmarks, which will reduce FPS difference by around 3.3%. New Target Metric=21.3% Finally, my Powercolor Red Devil Vega 64 averages out to be 2.7% slower than the RX Vega 64 LC model on the stock Power Plan used by AMD Labs. New Target Metric=24% Therefore, using official in-game benchmarks, we should expect to see around a 24% performance increase between these two GPUs: Powercolor Red Devil RX Vega 64 100% Radeon VII 124% Test System Ryzen 2700X PBO - Powerdraw allowed up to 150watts. DDR4-3421-CL14 Low Latency Subtimings at 1.47volts. 7 PC case fans and one 240mm AIO for the CPU. Gigabyte Auros X470 7 WiFi (BLCK 100.7) with onboard Audio used. 500GB SSD. Corsair 850Watt Platinum PSU 94% Efficiency. GPUs Powercolor Red Devil Vega 64 Adrenalin 19.2.1 335watts Averaged Out -/+ 10watts depending PC game Engine. 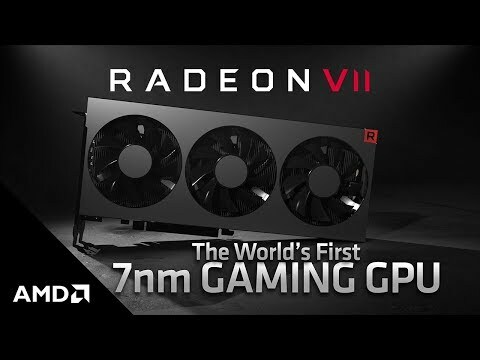 106.3% over Reference Blower Vega 64 Sapphire Radeon VII (AMD manufactured) Adrenalin 19.2.1 255watts Averaged Out -/+ 10watts depending PC game Engine. Testing with a Watt-Meter from the Plug Socket Default Power Plans for both GPUs. Strange Brigade Benchmark - every option set to Ultra Red Devil Vega 64 Total System Power Draw =501watts Radeon VII Total System Power Draw =390watts 110watt power draw reduction during the Strange Brigade Benchmark. Shadow of the Tomb Raider - Highest Preset. Red Devil Vega 64 Total System Power Draw =484watts Radeon VII Total System Power Draw =404watts 80watt power draw reduction during the Shadow of Tomb Raider Benchmark. FPS Result Performance Increase at 3840x2160p 12 PC Games Ashes of the Singularity Vulkan Crazy Preset Red Devil Vega 64 =49FPS (100%) Radeon VII =58.3FPS (119%) AC Odyssey highest Preset Red Devil Vega 64 =34FPS (100%) Radeon VII =41FPS (120.5%) Deus EX Mankind DX12 Divided Ultra Red Devil Vega 64 =31.3FPS (100%) Radeon VII =39.6FPS (126.5%) Far Cry 5 Ultra TAA Red Devil Vega 64 =47FPS (100%) Radeon VII =60FPS (127.5%) Forzia Horizon 4 Ultra Red Devil Vega 64 =66.7FPS (100%) Radeon VII =75.9FPS (114%) Hitman DX12 Ultra Red Devil Vega 64 =64.30FPS (100%) Radeon VII =78.15FPS (121.5%) Hitman 2 Ultra Mumbia Benchmark Red Devil Vega 64 =50.5FPS (100%) Radeon VII =62.47FPS (124%) Rise of the Tomb Raider DX12 Highest Preset Red Devil Vega 64 =49.95FPS (100%) Radeon VII =58.88FPS (118%) Rainbow Six Seige Ultra 100% TAA and 100% Render Scaling Red Devil Vega 64 =51FPS (100%) Radeon VII =65FPS (127.5%) Shadow of Tomb Raider DX12 Highest Preset Red Devil Vega 64 =36FPS (100%) Radeon VII =45FPS (125%) Strange Brigade DX12 Ultra Red Devil Vega 64 =64FPS (100%) Radeon VII =87FPS (136%) The Division DX12 Highest Preset Red Devil Vega 64 =48.1FPS (100%) Radeon VII =59.9FPS (124.5%) The Performance Increase over the 12 PC games is 23.6%. Therefore, no real surprise in the performance delta for the Radeon VII, but a big surprise in power consumption. Returning to power consumption, Radeon VII draws identical power to GTX 1080TI Founders Edition for PC gaming and about 30watts more than the RTX 2080 Founders Edition. The 300watt TDP rating appears to be Compute or OpenCL productivity watt limit for things like Blender, Luxmark, etc.